The Easiest Tournament Management System on the market! TourneyX® has been tested by hundreds of tournament directors and thousands of anglers across the country. There is no other system that makes managing tournaments easier. Our system has a full list of features that benefit both Tournament Directors and Anglers alike when it comes to tournament management. To see a full list of features, visit our features page. Our system has been proven by hundreds of tournament directors. Standings are handled by the system and shown in real time. Save time by letting us do the math! Take registration fees for your tournaments that are sent directly to your PayPal® account. Our system has been proven by thousands of tournament anglers. Anglers register for tournaments directly from their Angler Dashboard. Pay registration fees and fish! Our real-time tournament system gives you up to the second rankings. As soon as the angler uploads his catch the rankings are updated. We have been compared to other online tournament systems. The main feedback we receive is "It's so EASY"
There is no system out there easier to use to set up real time fishing tournaments. Get Started For Free! Our tournament management system is being used by directors just like you. See what Directors and Anglers say about TourneyX®. 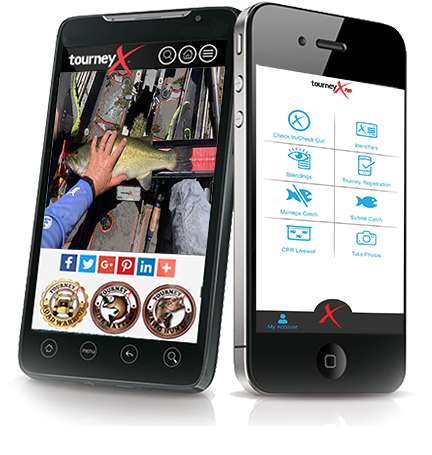 "...If you are going to fish a Catch / Photo / Realease format, TourneyX® is the number one way to go. Myself and the members of my club (LIKBF), will be using TourneyX for years to come." "...NYKBF is proud to use the TourneyX® app and platform for all its tournaments. The clean and efficient layout makes submitting a breeze for our new competitors as well keeping judging the events smooth as butter... we wouldn’t use anything else." "...The number one choice for serious kayak anglers everywhere with customer service that is second to none. Run into a snag at anytime and Dwayne is there to help." "...TourneyX® has been such a great tool in my quest to bring more women in to the fishing world. Especially when it comes to kayak fishing and tournaments. The simplicity of use and the ability to bring anglers all over the country onboard has been epic. As a person without a ton of tech knowledge I am able to set up, run and judge tournaments from anywhere. Not to mention the cost is ridiculously low. I love that this format makes it possible to encourage CPR fishing. Any time I have had a question or concern I am able to get info, advice and solutions quickly. I am sure there will be more of these type of apps etc in the future, but TourneyX® has definitely earned my loyalty."